> 日本語 . JPY ¥ . Previous image, 44 total items. Next image, 44 total items. Expedia's Kyoto vacation packages help you save money! Combining your bookings will give you more cash to splash for your awesome trip. Smart jetsetters can save up to 40,450 YEN* by getting a package deal on Expedia. Pick from more than 400 partner airlines and 321,000 worldwide properties via our extensive database of flights and accommodations. Fly with who you want, stay where you want — now that's the ideal vacation! You don't have to worry about postponing your family's plans, as we don't charge additional cancellation fees for almost all of our hotel bookings. Almost ready to head off on your Kyoto vacation? Can't work out what things to include in your travel schedule? No need to stress — we'll give you some suggestions. You'll find lots of amazing things to see in Kyoto. Famed attractions such as Nijo Castle and the Kiyomizu Temple ensure this will be a vacation that'll be etched in your memory forever. Boasting tourist attractions such as Fushimi Inari Shrine and Katsura Imperial Villa, there's never a boring moment in this exciting city. Once you're done having a look at those, continue in the direction of Heian Shrine and the Ryoanji Temple. A range of powerful people have resided in Kyoto Imperial Palace throughout the years. If you've ever daydreamed about living like aristocracy, be sure to visit this stately building. Adventurers in this destination have an abundance of choice. Theater can challenge the way we think and asks us to aspire to higher things. See a production at Gion Corner and open your mind to some big ideas. Still have time to spare? Constructed to pay homage to the gods, temples afford visitors an intriguing look into another religion and culture. Learn about the local belief system as you wander around the sacred monument of Toji Temple. Life is either an extraordinary adventure or nothing at all, so why not throw yourself into some new and unforgettable experiences? If you'd rather view a complete list of activities, go to our Kyoto things to do page. Securing comfortable places to stay is half the battle won when organizing luxury getaways or cheap vacations. Luckily, Kyoto has around 344 accommodations, so you'll be spoilt for choice. Fluffy robes, deep bathtubs and high-quality furnishings are just a few of the things you should find waiting for you at The Ritz-Carlton, Kyoto (Kamogawa Nijo-Ohashi Hotori, Nakagyo-ku) and the Nazuna Kyoto Nijo-tei ~Service&Dedication~ (580, Kusuriyacho). Book now for a taste of luxury! If you'd rather spend your hard-earned money on things such as hair-raising adventures and wild nightlife, why not investigate some of our low-price options? The Ryokan Yoshida-sanso (59-1 Yoshida Shimo-ooji-cho, Sakyo-ku) and the Kujo Stays (8, Higashikujo Nakatonodacho) come recommended. No journey to Kyoto is complete without stopping off at Nijo Castle. 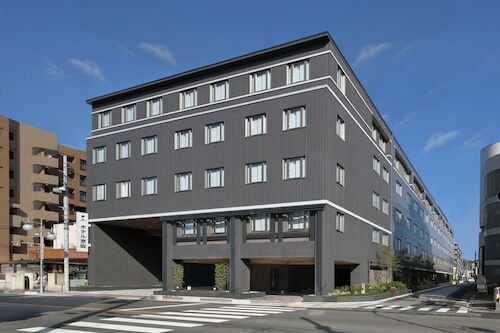 The Konruri-An Machiya Residence Inn and the Fushizome-an Machiya Residence Inn are both within walking distance. Just 25 miles (40 km) away, Itami Airport (ITM) is the closest terminal to your destination. Fasten your seat belt and tear your eyes away from that in-flight film — your wonderful trip to Kyoto isn't far off now! *Savings based on all vacation package bookings with Flight + Hotel on Expedia.com from January through December 2017, as compared to price of the same components booked separately. Savings will vary based on origin/destination, length of trip, stay dates and selected travel supplier(s). Savings not available on all packages. For Free Flight or 100% Off Flight deals, package savings is greater than or equal to the current cost of one component, when both are priced separately. Constructed entirely without nails and built on high poles, this temple is part of a World Heritage Site and offers visitors both beauty and history. Visit the world of the wealthy and powerful shogun, in this opulent 17th-century castle complex. This shrine at the base of Inari Mountain is dedicated to the goddess of rice and prosperity. See its thousands of red gates around a network of beautiful trails. This is a great walk to orient yourself around Kyōto. Stroll along a cherry tree-lined canal and visit shrines, temples, gardens and boutiques. Explore this hillside temple which features a statue with an unusual history, connected wooden walkways, a bathhouse and a steam house. Watch as park staff feed about 130 wild snow monkeys on Arashiyama Mountain, or climb inside a cage and feed them yourself. Built in the 14th century for a shogun, then rebuilt twice, this temple is now a Buddhist site and its top two floors are completely covered in gold leaf. Modeled on the fictional setting in a novel, this site has one of Kyōto’s greatest traditional gardens and architectural treasures. In a city known for its temples and other ancient relics, this observation point catches the eye as an example of 20th-century innovation. This institution is the home of manga in Kyoto. It holds exhibitions, workshops and events devoted to the promotion of Japanese literary art. An important shrine for patriotic locals and curious tourists alike, this site has charming buildings and natural gardens that celebrate Kyoto’s fusion of past and present. This shrine was dedicated to spirits in the 6th century. Now, it survives as the oldest of its kind in Kyoto, pre-dating the city itself. As one of the principal museums of Japan, this site displays fascinating artifacts across impressive structures to tell the story of Kyoto’s place in the country. Observe traditional Shinto architecture, pretty lanterns and sacred rituals at this historic shrine, home of the annual Gion Festival and Kyoto’s favorite cherry blossom park. Features such as one of the most famous rock gardens in the country and a placid pond with charming islands distinguish this temple from others in the city. More than any other site, this shrine is celebrated for the unrivaled autumnal colors of the trees surrounding the spiritual Zen haven. This temple is the famous site where thousands of hand-carved deities from the 13th century flank the longest wooden building in Japan. As a place that celebrates 20th-century contemporary art, this museum has innovative themes that are very different from traditional Kyoto culture. Art, elaborate gardens and a giant gate await at this temple that stands tall as one of the most important of its kind in the country. This is a shrine devoted to a peaceful and learned environment with an impressive gate, natural greenery and a serene atmosphere. The To-ji Temple is one of the preeminent traditional sites in Kyoto, with exquisite structures, a flea market and the tallest pagoda in the country. Visit this Zen Buddhism temple for a slice of history, art and tranquility. It is said that the temple is the oldest of its kind in Kyoto. With picturesque blossom gardens and a golden hall considered a national treasure, this temple is a historic monument devoted to bliss and tranquility. This temple is a hidden gem with majestic halls that open to the public on select occasions. A widow built this temple in 1606 to pay homage to her late warrior husband. Today, it survives as an eye-catching site of tranquility with postcard-pretty gardens. This temple borrows its graceful quality from the imperial family. It is home to traditional art, spiritual statues and a bamboo orchard. Come to this market in the heart of the city to experience the authentic sights, smells and sounds of the bartering vendors and their traditional food. Imagine life as it was during the Taisho Period as you explore this preserved Kyoto alley, complete with traditional teahouses, inns and kimono-clad hostesses. This shrine was created in 947 to mollify a furious spirit. Now, students and tourists gather to soak in the ambience of its traditional architecture and gardens. Visitors come to this ancient site for its pleasant temple but stay to relish the nature and tranquility of its serene Zen garden. A major center of Zen Buddhism, this stylish, ancient relic is ranked as one of the great temples of Japan. Located in Central Kyoto, this romantic hotel is within 1 mi (2 km) of Higashi Honganji Temple, Kyoto Tower, and Sanjusangendo Temple. Nishiki Market and Kawaramachi are also within 2 mi (3 km). Kyoto Station is 7 minutes by foot and Kujo Station is 14 minutes. 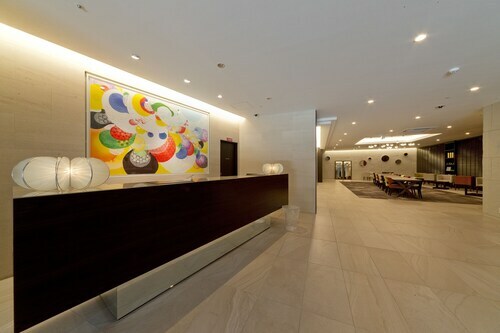 Decorated throughout with 1,000 works of museum-quality art, this hotel is adjacent not only to Kyoto Station, but also the city's largest shopping mall, making it a convenient spot for all travelers. 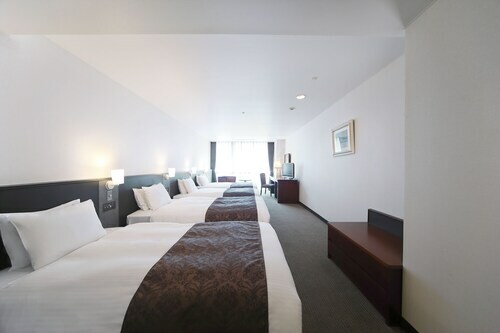 Guests of Rihga Royal Hotel Kyoto can walk 7 minutes to Kyoto Station or use the hotel's free shuttle service. Nearby attractions include Kyoto Tower, Nishihonganji Temple, and Kyoto Aquarium. 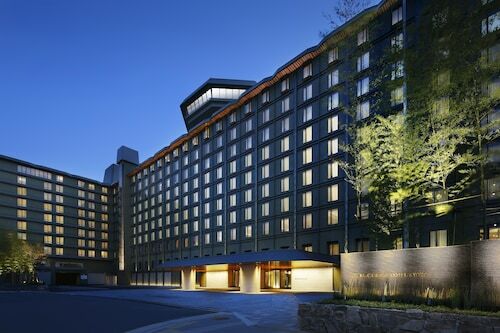 Situated in Kyoto, this hotel is within a 15-minute walk of Kyoto TERRSA and Kyoto Tower. Kyoto Aquarium and Toji Temple are also within 1 mi (2 km). Kujo Station is 6 minutes by foot and Kyoto Station is 8 minutes. 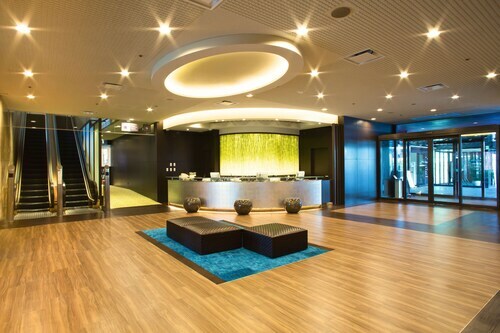 Situated in Kyoto, this hotel is within 1 mi (2 km) of Kyoto TERRSA, Kyoto Tower, and Sanjusangendo Temple. Kyoto Aquarium and Toji Temple are also within 1 mi (2 km). Kujo Station is 8 minutes by foot and Kyoto Station is 10 minutes. 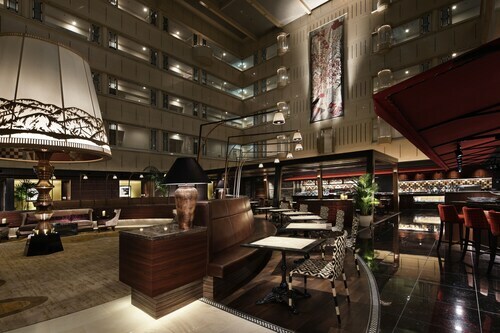 Located in Central Kyoto, this hotel is within a 5-minute walk of Honnoji Temple and Pontocho. Kawaramachi and Nishiki Market are also within 10 minutes. Kyoto Shiyakusho-mae Station and Shiyakusho-mae Station are within a 5-minute walk. 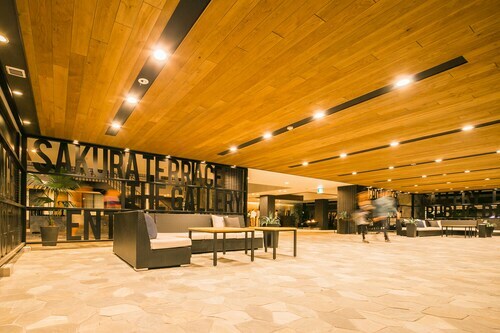 Situated in Kyoto, this hotel is within a 15-minute walk of Kyoto TERRSA and Kyoto Tower. Toji Temple and Sanjusangendo Temple are also within 1 mi (2 km). Kujo Station is only a 4-minute walk and Jujo Station is 12 minutes. Located in Central Kyoto, this hotel is within a 5-minute walk of Kyoto Tower and Higashi Honganji Temple. Kyoto Aquarium and Toji Temple are also within 1 mi (2 km). Kyoto Station is 5 minutes by foot and Gojo Station is 13 minutes. These prices were available within the past 7 days. Prices quoted are per person, round trip, for the period specified. Prices and availability are subject to change. Additional terms apply. Expedia.co.jp logo is a registered trademark of Expedia, Inc. Unauthorized use is strictly prohibited. Expedia, Inc. is not responsible for content on external Web sites. © 2019 Expedia, Inc. / Expedia Asia Holdings Mauritius / BEX Travel Asia Pte Ltd. All rights reserved.